Hockey is one of the most physical and exciting sports, and it shows with violent collisions, speeding pucks, and even fisticuffs. But this game, when played at such high speeds, can get out of control, and someone can get really hurt. Within the last couple of weeks, there have been a few instances where players delivered hits on other players, that seemed to be directed at the head area, or against the boards in a questionable position. For example: The New York Islanders’ Michael Grabner delivered a hit to the head of Carolina’s Nathan Gerbe, subsequently earning a 2 game Shanaban. Also recently, Colorado’s Cody McLeod hit Detroit’s Niklas Kronwall from behind into the boards, thus earning him a 5 game suspension. Kronwall was stretchered off the ice. Other “preventable” injuries include Montreal’s George Parros’ concussion sustained from a fight, where he was dragged to the ice and knocked out cold (hasn’t returned, no timetable given either), and last year, New York Rangers’ Marc Staal getting hit in the face by a slapshot, when not wearing a face shield. The real question is: Even though the NHL is doing what they can to prevent concussions and neck injuries, sustained from collisions that seem dangerous and reckless, how can they further stop these hits from happening? Even though innocuous hits to the head garner a 2 minute seat in the sin bin, people still do it, whether by accident, or with intent. Also, what can they do about injuries sustained in fighting, and injuries sustained from getting a puck or a stick in the face? The answer? Not too much more than they are already doing. First, lets look at the hits to the head. While there are those hits that seem like they have malicious intent, with the player’s head in the cross-hairs (see Grabner’s hit), they usually don’t. If you ask me, there isn’t much the hitter can do when they already commit to the hit. When you’re on ice, or even when you aren’t on ice, it’s hard to stop your momentum on a dime when you see the opposing player suddenly change to a more prone position, where their head seems to be in a place where it’s easy pickin’s. This kind of hit actually used to be legal, and encouraged. The hit Scott Stevens put on Eric Lindross in Game 7 of the 2000 Eastern Conference Finals, one which may have ended the better portion of Lindross’ career, was legal, and looked on with amazement. Nowadays, it’s hard to believe that he wouldn’t have gotten suspended. Stevens’ career was made with those kind of hits, being known as one of the most vicious open-ice hitters in history. 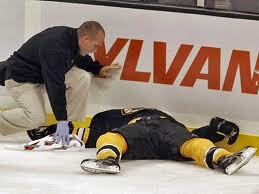 Since his retirement, however, the NHL has really tightened down on this kind of hit. It should be a suspension-worthy offense. But it’s hard to blame the player after they’ve committed to making the hit, especially if its’ been a part of their game their entire lives. Hits from behind, like McLeod’s fine example, have no place in hockey. The boards aren’t made of pillows, and the human neck and spine aren’t reinforced with steel cables. It’s a simple formula, if you see the numbers, don’t make the hit. Just ask Steve Bernier, because he got a ton of it from Devils fans in the Cup finals (myself included). Fighting has been a huge debate over the last few years, whether it’s the necessity of it, or the players who regularly engage in the tradition of dropping the gloves in a gentlemanly manner and proceed to punch the other dude in the chops. While I do understand the (un)-safety procedures, it’s very different than checks to the head. How? Simple. Both fighters agree to settle their differences, as opposed to a check to the head, or a check from behind, which is oh so obviously not consensual. Besides, fighting has it’s place in the game, and not just for fan entertainment or as an outlet of stress from a player’s perspective. It’s meant to garner some energy and momentum for a team, and to protect the big guys from going after the little guys. 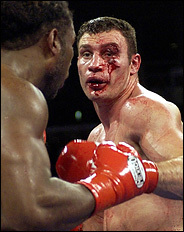 Fighting is fine, and it’s not like boxing, where people look like http://graphics8.nytimes.com/images/2005/11/10/sports/10boxing.jpg after a good tilt. Usually, the two agree to the fight in the manner of, “Hey wanna go?” “Sure.” They fight (usually turns into a wrestling match anyway), get a couple of hay-makers in, acknowledge the other guy, and go sit in the box for 5 minutes. Almost entirely harmless. The visor mandate is fine by me, but will it really do much more than it has? In the -2013 season, approximately 73% of players in the NHL wore visors. The other 27% were grandfathered in, so that they only choose whether they want it or not (see helmet mandate in 1979). Rest assured, though, there won’t be a Craig MacTavish, who ignores the rule for 17 years. I digress. Consider how a puck hits your face. It’s gotta lift off the ice. Same with a stick. The only direction that isn’t protected, is where the puck or stick will hit you. If you really want player safety in that department, mandate college-style face shields. Since I know they won’t, I’ll give up on that argument now. But if you look at the ways a puck or stick can hit the face, a visor only covers the eyes, where the player usually gets hit in the mouth or below. A visor will only do so much. To wrap it all up, the NHL is doing a great deal of things to prevent those injuries deemed preventable. I know there is a much safer way of playing hockey, but that involves roller blades and a small orange ball in a street somewhere. Injuries will happen. Preventable injuries will happen. That’s why there is supplemental punishment. But I don’t think the NHL DOPS can do much more to keep the game where it is, and make it as safe as possible.